The Uncluttered and Elegant Garden is on page 57 in Gardening from a Hammock. Master Gardener Mary Fisher has made a dramatic statement in the simplicity and balance of her garden. 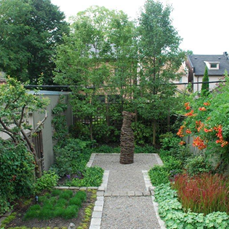 Her garden requires little work and yet provides year-round interest and contrast with its relatively few plants and its geometric patterns. She is the 2010- 2012 co-chair of the Board of Directors, Toronto Botanical Garden. Mary is a former coordinator of Toronto Master Gardeners and remains an enthusiastic city and country gardener.